Good news for wearables enthusiasts! We’ve added a new test platform to the Betabound community so you can add the wearables you own to your profile. By sharing what wearables you own, we can better inform you when wearable beta testing opportunities arise that we think you might be a good for! Wearables are a new, booming industry. After analyzing the results of our recent fitness wearables survey, we realized how much our community was investing in fitness wearables — so we wanted to take those results one step further. Our new wearable test platform covers fitness trackers, kid wearables, smart glasses, pet wearables, virtual reality, wearable cameras, smart watches, and more! As this industry grows, it’s important for us to know who in our community has invested in this technology. By doing so, we can better understand who would be ideal candidates to test emerging wearable products, as well as products that integrate with your wearable device. Updating your test platforms increases your chances of getting selected for upcoming tests in two ways. First, it allows us to send you testing opportunities we think you’d be a good match for right away. For example, some of our clients request testers who already own a specific wearable device, so having an up-to-date wearable test platform ensures you’re not overlooked. Second, our beta managers look for people with current profiles since having an updated profile shows you’re detail-oriented — a quality our team looks for in rockstar testers. You can increase the likelihood of being selected for one of our beta tests by making sure your test platforms are as complete and up-to-date as possible. To add the wearables you own to your profile, log in and click the “Add New Platform” link on your community profile homepage. Next, click on the new “Wearable” link to go to the new platform. 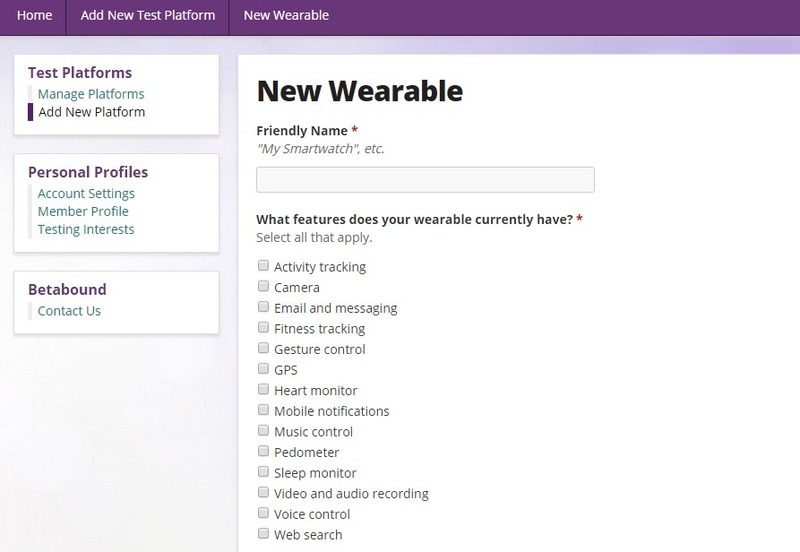 On the form, you’ll be asked to give us detailed information about a wearable device you own. To enter multiple wearable devices, you’ll have to fill out the form for each wearable device. After naming your wearable device you’ll be able to tell us more information about the device’s brand, functionalities, and your overall ownership of the product. 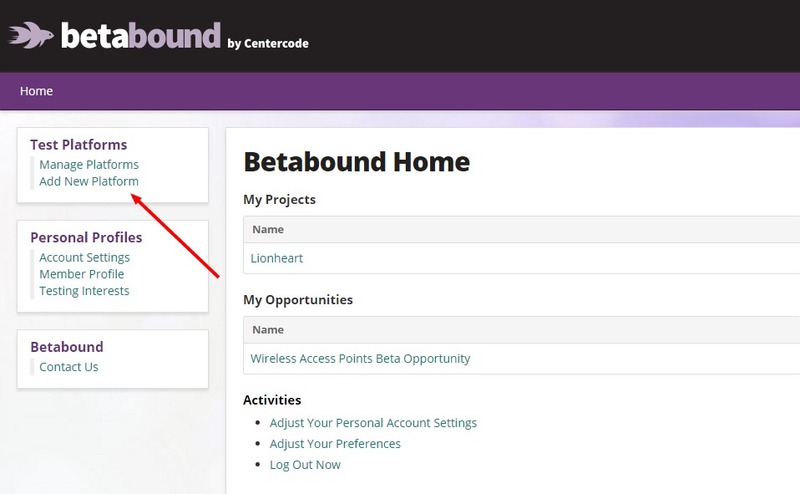 If you notice a major brand or category is missing, or you have a recommendation for improving this form, please feel free to email us at hello@betabound.com or comment below! We’d love to hear your feedback. Ready to update your test platforms? Log in now!